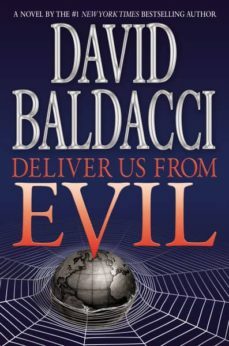 David Baldacci’s protagonists from the international bestseller The Whole Truth return in DELIVER US FROM EVIL. In South America a 96-year-old man of great wealth reads a book late one night and an hour later he lies dead in his bed, the secrets of his past starkly revealed. Six months later another mystery man lies dead at the bottom of his pool in a villa in Provence. This time, however, there’s a witness at the scene: Shaw, the shadowy operative from The Whole Truth. Meanwhile, a half a world away, photojournalist Katie James is working on a story of international importance. But shortly after her meeting with a potential inside source, she is smuggled unconscious onto an airplane headed to an undisclosed destination. In the days to come, Katie and Shaw will be reunited in a deadly duel of nerve and wits against a surprising, secretive enemy and led around the world at a breakneck pace.